It is different outside today. It is sunny, yes, but hot. Sultry even, with a high expected in the 90s. Different. So different from that morning. That morning on that day. That day dawned clear and cool, one of those spectacular fall mornings where the deep blue of the sky and the crispness of the air makes you glad to be alive. And that day ended with so many in this area where I have chosen to make my home no longer alive. As in years gone by, relatives will gather today. At the now-two-year-old memorial plaza in Lower Manhattan. At the Pentagon. At the Flight 93 National Memorial in Shanksville, Pennsylvania. As in years gone by, bells will be rung. Wreaths will be laid. And the names will be read. All those names. The names of the old, and of the young. Of those desperate to live. Of those who perished anyway. Of those whose bodies were lovingly buried by their families. Of those of whom nothing but dust remained. Of all those who should not have died, not in that way, not on that beautiful fall day, now 12 years in the past. As in years gone by, the readers will pause six times during the reading of the names. Six times for a moment of silence. • At 8:46 a.m., the time when the first plane slammed into the North Tower of the World Trade Center. • At 9:03 a.m., the time when a second plane slammed into the South Tower. 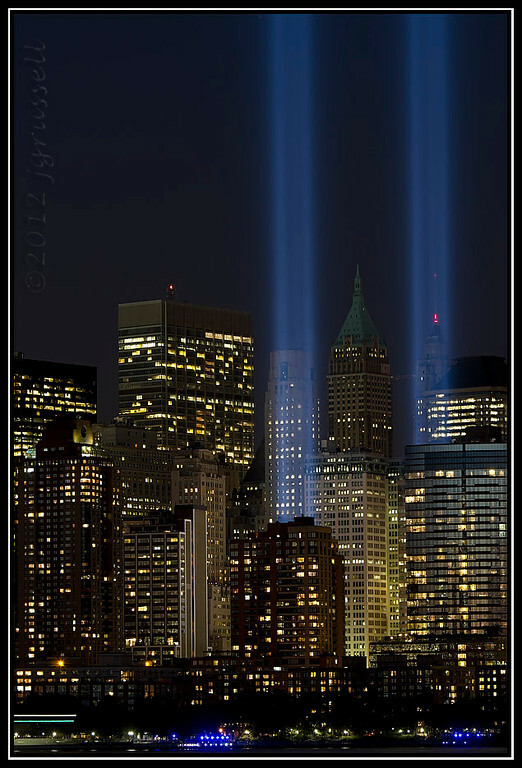 As in years gone by, as it has each year since 2001, the tribute of lights, depicted above and below, will shine into the skies above Ground Zero tonight. And as in years gone by, as we have each year since 2001, we will weep. I have been writing and posting these 9/11 essays every year since 2001.1 For nine years, I wrote in anger and despair. It was beyond my comprehension that those responsible had not been brought to justice. It wasn’t until 2011 that I could write that the man responsible for that terrible day in 2001 — Osama bin Laden — had finally been called to account for what he had set in motion. It helps, just a little, to know that he paid the same price he exacted from his victims. Because there is so much that we have lost. Teenagers have gone to proms and graduated and attended college and married and become parents themselves… without their parents there to see their accomplishments. Parents have grown old and grey and faced the declining health that awaits us all… without their adult children there to hold their hands. Husbands have learned to tie the ribbons in their daughters’ hair, because their wives were not there to do it. Wives have learned to teach their sons to tie their neckties, because their husbands were among the fallen. Brothers without sisters, sisters without brothers, lovers torn asunder. The would have, could have, should have beens of more than 3,000 people. And we mourn for what we ourselves have lost. The innocence, the faith, the trust of that September morning. We still wince at the sound of bagpipes here in the New York area. We shy away from listening to one more rendition of Amazing Grace. We still look up in fear at the sound of a low-flying plane. We cannot bear to look at the photographs or watch the memorial programs. But as we weep, perhaps because we weep, we keep the promise that the lives that were lost will not be forgotten. I stood in the wreckage of lower Manhattan not long after that terrible day. And I made a promise that September all those years ago. A solemn pledge that I would remember. And as in years gone by, it is time now to keep that pledge. It is time again to remember. To open, once more, the film cannister into which I brushed some of the dust of Ground Zero. To touch that dust with my own hands. And, once again, to stand witness. To make sure that I do not forget. That we do not forget. That no-one forgets. That all those lives will never be forgotten. We all should weep today, Skip. Thanks, Wendy. This is such a hard day. Wonderful tribute, Judy. Thank you. Thanks, Leslie. Hard to believe it’s been 12 years already. I’m going to stand out on a limb here and say that all this maudlin memorializing is not terribly healthy, productive, or good for this country. We need to move forward unencumbered by a need for revenge (“justice”). We need to be the best country we can be, not one consumed by relentless grief, paralyzed by fear, or stuck in the past. 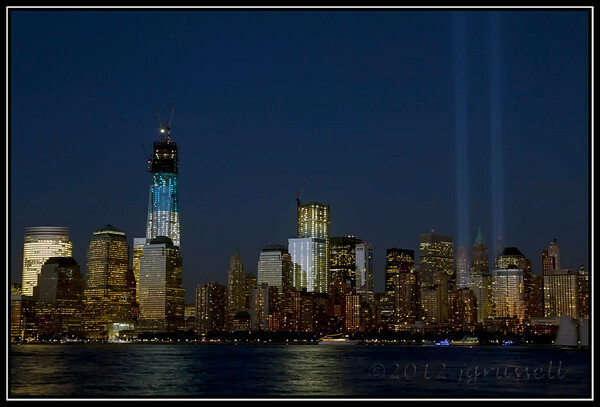 The best way to honor those lost is to make this a country that no one wants to harm or destroy. “To everything there is a season.” Remembering the past has its season, as does moving forward to do just what you’re suggesting. There’s probably no one who wants to harm or destroy Liechtenstein or Denmark, maybe not even Canada. But the US continues to be the world’s most powerful nation, and still attracts the ambitious and seekers of ‘freedom’ from almost everywhere, and celebrates the virtues of freedom over dictatorial regimes. Our attackers in 2001 descended from the same fanatics who have been at war with the western world for over 700 years. Sitting around a camp fire, holding hands with our neighbors, and singing Kumbaya won’t deter them … only strength, determination, and wise leadership will. Judy’s essay beautifully expresses our desire for peace, our sorrow, and fortitude for the future. Thank you, Judy. Not sure deterrence is even possible in this world. A simply beautiful and moving tribute. Thank you. Thanks for the kind words, Jana. It never seems to get any easier. It’s a hard day for a lot of us, Barbara. Once again, Judy, you’ve brought me to tears. I’m never the only way on this day, Debi. and for those to come. Remembering that day here in Australia too. We woke up to the news on the morning of the twelfth and I remember the overwhelming sense of disbelief and horror. A defining moment of our times – before hand seemed so innocent. I also remember feeling so very terrible on behalf of friends from Afghanistan, now Australians but who had been refugees. They were devastated by the news – on behalf of those who died and were injured but also because of possible retributions against their countrymen – at that stage responsibility was not clear. It hit hard all around the world, Anne… and I can’t imagine what the Afghanis were thinking. Thank you, Judy, for your poignant remembrance column. I too weep each and every year. Who can ever forget? I sure hope we never forget, Louise.